No business can afford to stand still. Global competition and rapid innovation are raising the bar for organizations to continually develop new products, increase customer satisfaction, improve quality, and reduce costs. Every organization needs operational excellence. In some cases, business leaders may know where they have opportunities for strategic improvements. In other cases, however, the task can be overwhelming, with business processes spanning multiple functions across multiple geographies. Where do you focus your business process improvement efforts to gain the greatest benefit with the least amount of effort? An exhaustive effort to improve the efficiency and effectiveness of all business processes is rarely justified. Our consulting methodology, rather, is to identify the areas of highest priority, with the greatest payback, and where the recommendations have the greatest likelihood of being implemented. We do this with a broad-based data collection effort to prioritize the business processes most critical to organizational success and also in most need of improvement. For each selected process, our business process consultants then conduct a high-level business process framing exercise to define process boundaries, process owners and key actors, major steps, issues, and the vision for improvement. Our “six-pillar analysis” evaluates a broad set of process enablers: workflow, information systems, incentives, human resources, policies, and facilities. If the effort is warranted, we also map the processes in their “as-is” state. Formalize the Process. For processes that perform at an acceptable level, it may be enough to simply formalize them through process modeling and process mapping, by documenting roles, responsibilities, major activities, and performance criteria, and then training and coaching process actors throughout the organization on the formalized process. Improve the Process. Processes that are substandard in terms of cost, schedule, or quality may need optimization, but not wholesale process transformation. Here, our recommendations may be to eliminate waste, combine tasks, do activities in parallel, automate elements of the process, or apply industry best practices. The goal is reducing cycle time, improving quality, and optimizing costs. Re-engineer the Process. Business processes that are beyond repair or show opportunity for breakthrough performance may require radical transformation through business process reengineering. Here, we facilitate breakthrough thinking and application of new technologies to achieve multiple times improvement in performance. In implementing any major change initiative, it is also important to pay attention to the people side of change. Our consultants can also provide the expertise needed to develop the change management program, so that all process practitioners have the awareness, desire, knowledge, and skills needed for continuous improvement. Our change management framework also ensures that each major process has a process owner and process actors with defined roles, responsibilities, and process metrics. Our consultants bring a variety of tools and methodologies for improving business processes, too numerous to list completely. Our toolbox includes data-gathering tools, such as online surveys, interview questionnaires, and direct observation. We have an extensive portfolio of analysis tools such as process framing, value stream mapping, Ishikawa diagrams, root cause analysis, and Pareto analysis. We are especially fond of the Theory of Constraints, with its current and future reality tree and conflict-resolution diagramming, as well as lateral thinking for problem solving and finding breakthrough solutions. For clients in the manufacturing, wholesale, and retail industries, our consultants are also skilled in lean manufacturing, lean six sigma, kanban, kaizen, just-in-time, total quality management, and material flow optimization. 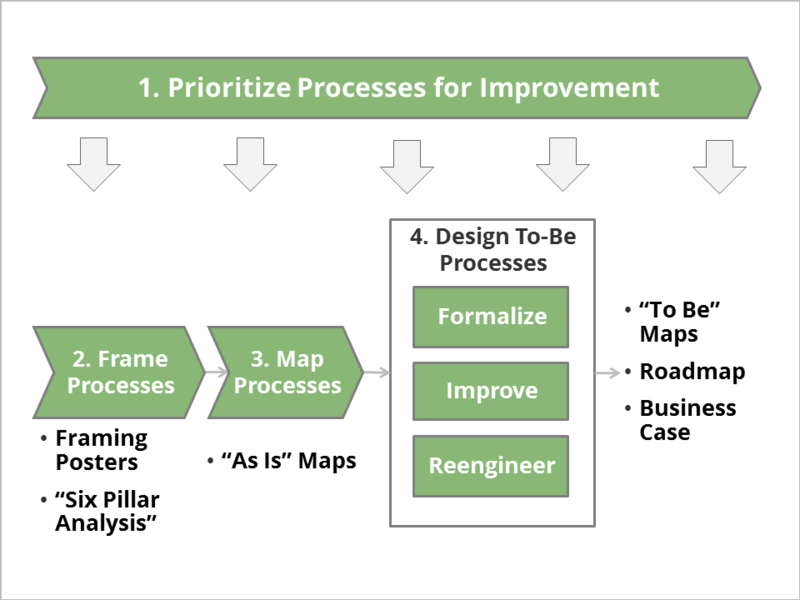 Not every process needs the same level of business process improvement. By analyzing and prioritizing your needs and focusing your efforts, you can achieve significant improvement in profitability and gain competitive advantage in the shortest time possible.